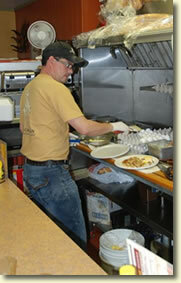 The Chuckwagon Restaurant on Mackinac Island, Michigan: Stop by for breakfast or lunch! Where the locals eat! "Breakfast here two mornings! Shows all you need is a nook in the wall with awesome food! Inspiring!" 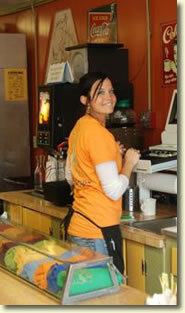 Stop by the Chuckwagon for breakfast or lunch on your next visit to Mackinac Island, Michigan! 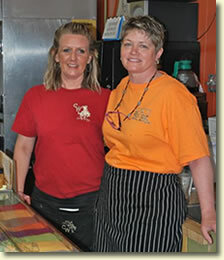 One of Mackinac's best loved restaurants, the Chuckwagon has been serving locals and visitors for almost 60 years. Sit at our counter or at our friendly tables while we prepare your meal quickly using only the finest ingredients, including our personal touch! We are conveniently located on Main Street across from the Shepler Ferry dock. We look forward to meeting you! We were featured in USA Today's Taste of Mackinac! "This Tiny Restaurant In Michigan Serves Burgers That Are Worth Waiting In Line For"... Read the article in "Only in your State"
Read about our mention in Traverse magazine! "Best wishes Sharon, great burger!" "There are a few places in the world that do something simple and well. This place is all about the burgers, and you should try one." "I love your place because your love for people shows thru!"